As part of the Acts of Whimsy for this year's Geek Girl Con, I decided to make a recording of the synthesis of my favorite Evans chiral auxiliary. I hope you enjoy. Please, if you can, feel free to donate to the cause. Just like last year, if you donate and tell me, I will offer you a handwritten thank you note and for any donation of $20 or more, I will write a post of your choosing. Thanks to Philip Skinner, Matt Hartings, See Arr Oh, Jess the Chemist, Rachel Pepling, Chris McCarthy and Stephen Davey for making it fun! "To the contrary, there is evidence that select groups of workers have been had sustained wage growth, implying persistent skill shortages. Some specific occupations such as nursing do show sustained wage growth and employment growth over a couple decades. And there is more general evidence of rising pay for skills within many occupations. Because many new skills are learned on the job, not all workers within an occupation acquire them. For example, the average designer, who typically does print design, does not have good web and mobile platform skills. Not surprisingly, the wages of the average designer have not gone up. However, those designers who have acquired the critical skills, often by teaching themselves on the job, command six figure salaries or $90 to $100 per hour rates as freelancers. The wages of the top 10% of designers have risen strongly; the wages of the average designer have not. There is a shortage of skilled designers but it can only be seen in the wages of those designers who have managed to master new technologies. Surely his assertions about the relative wages of the 90th versus 50th percentile of graphic designers have been statistically substantiated somewhere. I think he's completely spitballing when he says that "the occupational groups are organized in order of declining computer use". In what sense? Professor Bessen's argument seems to be an application of the "superstar effect" writ large to broader groups of employees. (i.e. top income earners are just better than the rest of us, who have not learned these desired skills.) While I might be convinced of that, I think I've yet to see evidence of it and I think the implication of a "skills gap" is still unfounded. Anyone heard anything about PPG? ...Beyond the Allison Park facility and the company's namesake headquarters located in downtown Pittsburgh, PPG operates additional research centers in Springdale, Monroeville and Harmar, as well as the company's newly established Architectural Coatings North American Headquarters in Cranberry Township. Kahle said PPG is adding over 300 technical and non-technical jobs to Pennsylvania in 2014, which includes relocating some employees from Strongsville, Ohio to the new Cranberry facility. In the last three years PPG has hired about 160 new employees to fill technical positions, he said. All of the company's labs in Pittsburgh will be approaching 95 percent utilization in the next year and the company is discussing its options for the future. "From a technology point of view, I can't imagine a more exciting time," he said. "And that excitement is reflected in our sales." PPG had $15 billion in sales in 2013, up 12 percent from the previous year. Increased sales have also led to an increase in research and development investment, with the company spending $550 million last year on research efforts. I feel like PPG has been quietly expanding since ~2010 or so, but I don't really track them, other than they seem to be one of the few companies hiring chemists in the Pittsburgh area. My sense is that they put out about one or two entry-level Ph.D. inorganic/organometallic ads a year? Anyone have a better sense? Just in case you didn't know, it's not helpful to call out your direct reports on social media, especially platforms that lend themselves to screen shots and anonymous image sharing sites. “Consistent with other recent economic reports, including the Conference Board and the Chicago Fed National Activity Index, the Chemical Activity Barometer continues to point to a slowly expanding U.S. economy, at least through the first quarter of 2015,” said Dr. Kevin Swift, chief economist at ACC." It would sure be nice to have consistent signs of an expanding economy, but it doesn't look like we're there yet. Sigh. I see my coauthor Alex Goldberg has challenged me (along with Derek Lowe and Carmen Drahl) to the ALS Ice Bucket Challenge. I am honored to be included among them. Guess I'll get a bucket and a towel. Glenn Hess has a write-up of the MV Cape Ray's completed destruction of Syrian chemical weapons precursors. Jyllian Kemsley covers proposed new definitions of the mole and the kilogram. Sounds like a long argument between chemists and physicists. A dramatic reading of "A comprehensive overview of chemical-free consumer products"
I don't think I've ever received such a negative evaluation, but I did once have a manager tell me that I needed to work on my fundamentals. I was pretty irritated at that statement, but I managed not to let it show. (And some good came out of that statement.) There was also the time where a supervisor I deeply respect noted in a draft that my view of management was "cynical." Truer words could not be said, actually. I wish it weren't so. Readers, what's the worst thing someone's ever written about you in an evaluation? *What makes this particular leak unkind is that, according to the law firm, Laxalt himself had never seen the document. Yeowch. Working clean, constantly wiping and cleaning, is a desirable state of affairs for the conscientous line cook. That chef was right: messy station equals messy mind. I don't know if my hood is clean (answer: not really), but the inside of my head is definitely messy. 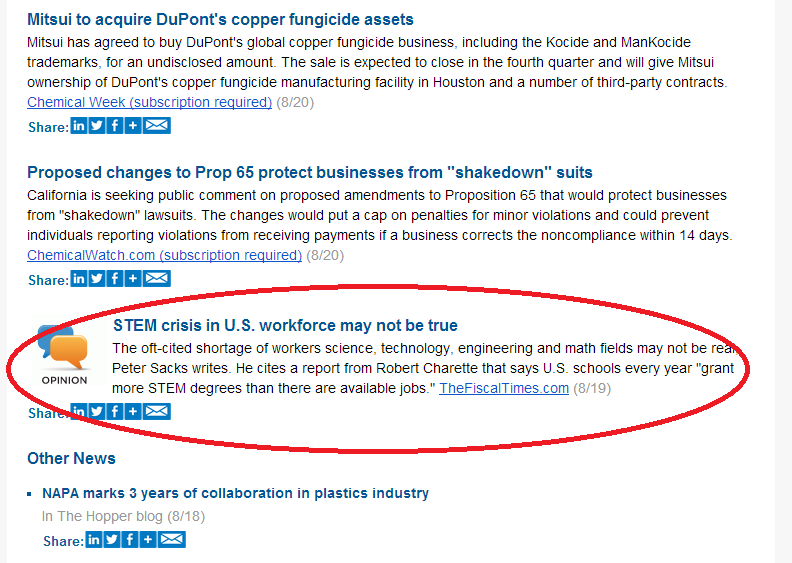 In the American Chemistry Council's daily newsletter, a link to a "Minding the Campus" piece by Peter Sacks titled "WHAT STEM CRISIS? THERE ISN’T ONE." Surely someone has screwed up here, sending this piece out. I like the cut of Mr. Sacks' jib. More generally, if the labor market is not enticing students to pursue particular fields, should public policy push them to do so? Manufacturers, for example, have long complained about the shortage of students interested in machinist training programs and assert that the cause has been that schools and guidance counsellors were not advocating for those programs. But the pay for such jobs has declined by 20 percent in real terms over the past two decades while the skill requirements for those jobs have shifted toward computer use, a field with better pay. The number of machinist jobs has already declined by 20 percent in that period (the total number of jobs in the economy has increased by 40 percent) and is expected to decline further (Cappelli 2012). The reasons why there has been a decline in the number of students taking vocational education courses that could prepare them for manufacturing jobs merits further attention, but we should not assume that it is independent from the attractiveness of the jobs offered at the end of those programs. Of course, I find this paper compelling and worthwhile, but I would, wouldn't I? Read the whole thing -- I have more comments later. UPDATE: I don't know why, but it seems that people are having a paywall for the NBER and I did not. Here's a Google Docs version. Someone doesn't like that C&EN has a paywall. 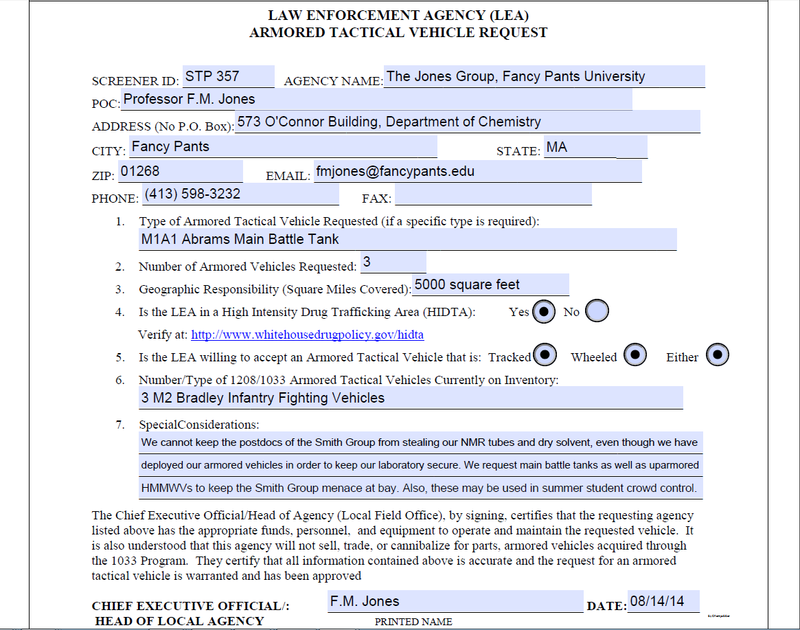 Apply for your own armored tactical vehicle here. Pfizer's John L. Smith captured the complexity and uncertainty facing these companies during the scale-up process: "The mold is as temperamental as an opera singer, the yields are low, the isolation is difficult, the extraction is murder, the purification invites disaster, and the assay is unsatisfactory." You know, that gives me a bit of perspective. That's a jobseeker-to-onsite positions ratio of ~7:1, which is slightly better than the 8:1 reported for the 2014 ACS Dallas Career Fair. Please note, registered seekers for the Virtual Career Fair are not representative of actual attendance. What do you mean, we've run out? It will take months to produce even a small batch of a promising new drug to counter Ebola, according to U.S. health officials. Mapp Biopharmaceutical’s drug ZMapp has shown some promise. 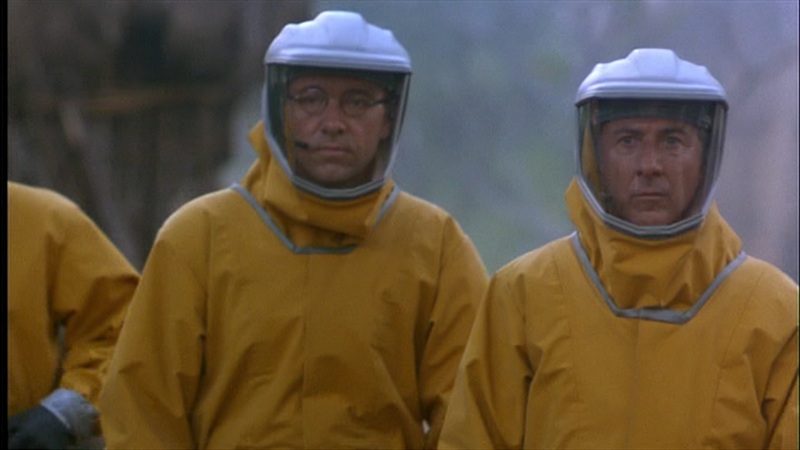 The drug has been used to treat two Americans who have contracted Ebola. But the company said Tuesday it has run out of supplies. Anthony Fauci, director of the National Institute of Allergy and Infectious Diseases says it will take months to make more of the drug. Even in that timeframe, the company will only be able to produce less than a hundred treatment courses. He said the government was trying to help Mapp “scale up” so that it could produce more of the medicine. The drug comes from the Nicotiana benthamiana plant, which health officials said takes longer than a month to grow. Substances from the plant then must go through months of processing before being made into ZMapp. Also provided herein are methods of producing antibodies or antigen-binding fragment that contain a substantially homogenous glycan composition using a plant or other eukaryotic expression system. Here's a much, much, much better explanation from David Kroll at Forbes. "Plantibodies" - I like it. I Am Not a Molecular Biologist, but it seems to me that this is a custom technology to manufacture pure bits of biomolecules by using plants (instead of yeast or whatever.) I somehow doubt that there is going to be enough successful technology transfer or successful research to substantially speed this process up. Mapp Biopharmaceuticals is out of ZMapp, and we'll have to wait until they can make more and there's very little the United States government can do about that. Best wishes, fellas. Process Wednesday: overdried a hydrate? You can rehydrate it! If I am overdried, re-hydrate me! Polymorphism undoubtedly will continue to be an issue for developing drug substances and for continued manufacture of drug products... Solid-state transformations should not be overlooked. Hydrates may be overdried; rehydration of a dried phosphate salt was carried out by passing moist nitrogen through the dryer. Upon drying, however, 1 dehydrates, and significant efforts were made to meet the challenge of consistent preparation of the monophosphate monohydrate salt. In collaboration with our Particle Science and Physical Properties departments no other hydrated forms were identified by standard solid form screening methods. Subsequently, the dehydration of the monohydrate was shown to be fully reversible by DSC, GVS, XRPD, and Raman spectroscopy. At scale, a reconditioning process was implemented using a Boltz dryer to achieve dehydration followed by the application of a moist nitrogen stream through the dryer to rehydrate to the monohydrate. This method proved robust and consistent for the manufacture of iNOS inhibitor 1 which was also analysed by a variety orthogonal techniques including chiral HPLC (99.9% PAR), metal analysis (Pd not detected), phosphate and water analysis (consistent with the monophoshate mononohydrate stoichiometry), and XRPD (consistent with desired polymorph and crystallinity). I suspect that overdrying events (especially when polymorphs are involved) are not usually so simple to fix, so it's still incumbent on process chemists to define the temperature parameters of drying steps and for operators to keep a careful watch over their drying temperatures. That said, it is very interesting to learn that, in this case, the solution was to "overdry" the material and then re-hydrate the molecule. 1. Rassias, G.*, Hermitage, S.A.*; Sanganee, M.J.; Kincey, P.M.; Smith, N.M.; Andrews, I.P. ; Borrett, G.T. ; Slater, G.R. "Development of a Supply Route for the Synthesis of an iNOS Inhibitor: Complications of the Key SN2 Reaction." Org. Process Res. Dev., 2009, 13 (4), pp 774–780. 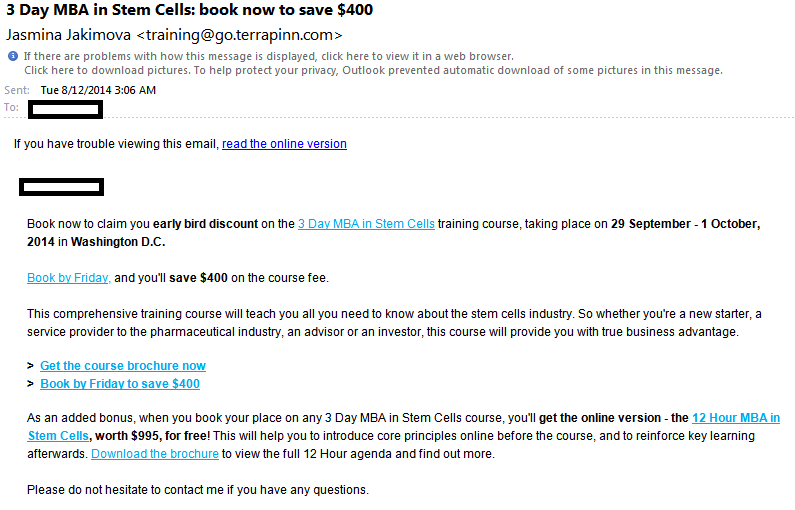 Chemist spam is fascinating: "3 Day MBA"? "We have landed on the Thirsty Bear Brewing Company at 8pm Tuesday night. 661 Howard Street, right near the W Hotel. Invite anyone you know who cares about hanging out with awesome people." Having read “Big Tussle over Tiny Particles” with great interest, I suggest that ACS sponsor a meeting between the parties involved and provide objective observers (C&EN, May 26, page 43). Francesco Stellacci would bring his nanoparticles, and Philip Moriarty would operate the scanning tunneling microscope at various gain settings. Everyone present would see for themselves whether the nanoparticles were actually striped or not, and the question would be settled. Unless one of the sides believes that ego trumps truth at this point, why would they object to such a meeting? I would personally find such a meeting both incredibly boring and really gripping. Big feature on the 100th anniversary of crystallography this week, including a fun editorial by Greg Petsko: "Clearly we are still a long way from the day when all structures of all molecules will simply be calculated from first principles. But if you seriously think that day will never come, I suggest you think again." This would make a great long bet, as to when that day would come. As a non-biologist, I learned a lot from this Matt Davenport article on the placenta. Another fine chemical M&A article by Rick Mullin, this one about phosgene manufacturers. Do you think that private equity firms owning chemical manufacturers is good or bad for their subsidiaries' chemical safety? I am skeptical, but reserve judgment. A German song about silicon. Truly catchy/strange. Here's a version with an English translation, for those who spreche nicht Deutsch. The article mentions the naval tradition of the "happy ship" and the "unhappy ship" with a passage taken from from one of Patrick O'Brian's novels of the Royal Navy. It concludes that the Cowpens seems to be cursed, which is a bit of traditional naval superstition. Not sure I buy that, but I can imagine the feelings from where it might come from, i.e. trusting your life to an incredibly complex set of human/machine interactions and also thousands of metric tons of steel. I definitely think there are happy labs and unhappy labs -- just like a naval vessel, much of this emotional state comes from the boss of the lab, be they an academic PI or an industrial group leader. I think a good leader can take their team through tough times and have them feel like they've accomplished something significant; a bad leader can make their team feel like they're incompetent and barely hanging on. There's not much physical infrastructure to rely on, so I don't think that scientists put much emotional stock in them. I don't think there are such things as 'cursed labs'*, but I'd be willing to listen to such stories. Readers? *Cursed instruments, though? I swear I've seen possessed balances. So there we were, some years and some moves back, gathered for an all-hands meeting in the conference room with the new CEO and our local health insurance provider's representative. And he starts off with announcing some Great News! for the company: now, instead of employees paying 50% of their health insurance tab, the company would cover the entire cost except for $50. And then there's something mentioned about changes to the company's willingness to pay for health insurance for dependents... [insert record player scratch here] And suddenly people realized that while the company was willing to pay for their employees, this company full of late-20-somethings and early-30-somethings with families was pulling support for spouses and children. If you don't have a family, your health insurance costs are going down! If you have a family, your health insurance costs are going up. We don't know by how much! That was a good day. It's nice to be able to laugh about it now. What's your favorite company-wide announcement disaster story? Um, Dear Leader, can I get you some PPE? ...Pleased that the factory is turning out with indigenous efforts and technology the products for which it relied on import in the past period, he instructed it to wage a dynamic drive for boosting the production of quality lubricant and grease required by all types of vehicles and providing them to various fields of the national economy in the future. Saying that the quality of goods produced by the factory is as good as the imported ones, he called for steadily improving the technical specifications of the lubricant and grease so that they may have international competitiveness. He gave precious instructions for managing and operating the factory. 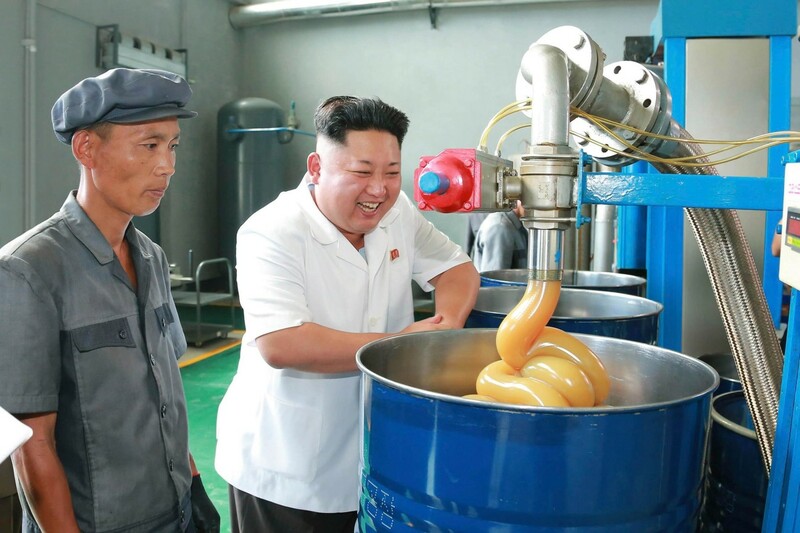 Good to know you can get open-top drums, flanges and braided hose in the DPRK, but where's the PPE? I sure hope the plant operator on the left there normally wears goggles or something. ...Grzybowski is also bidding for a grant from the Polish government, worth up to 7 million złoty (US$2.3 million), to use Chematica as the brain of a synthesis machine that can prove itself by automatically planning and executing syntheses of at least three important drug molecules. ...Rising rents and the difficulty of securing a mortgage on the coasts have proved a boon to inland cities that offer the middle class a firmer footing and an easier life. In the eternal competition among urban centers, the shift has produced some new winners. Newcomers in Oklahoma City have traded traffic jams and preschool waiting lists for master suites the size of their old apartments. The sons of Lorin Olson, a stem cell biologist who moved here from New York’s Upper East Side, now ride bikes in their suburban neighborhood and go home to a four-bedroom house. I get the sense from Dr. Olson's website that this is his first PI position. In that sense, then, I don't think it's the low cost-of-living nor the excellent play of the Oklahoma City Thunder that have brought him to that city, it is his first position as an independent researcher. Stuart Cantrill's retweet of this post reminds me that it is the 100th anniversary of the start of World War I, which reminded me of some relevant historical documents that a friend had provided me a number of years ago. 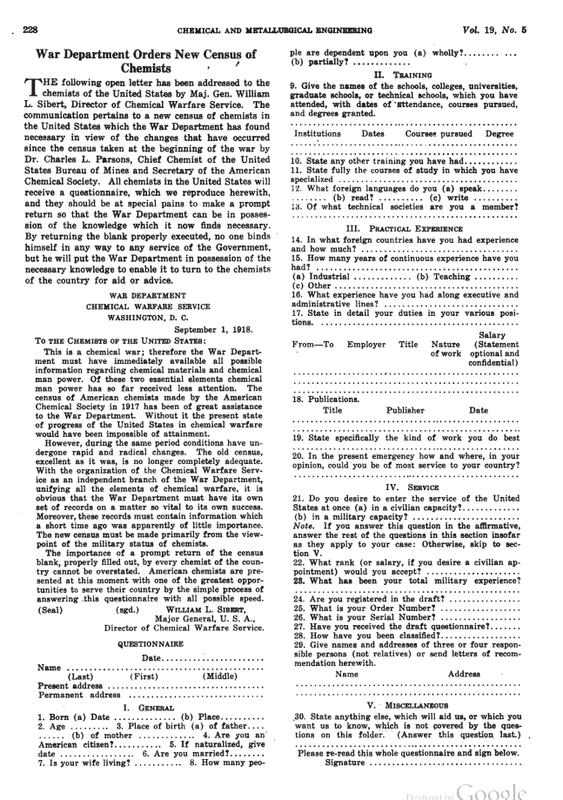 First, (to left) a September 1918 questionnaire in the pages of Chemical and Metallurgical Engineering from U.S. Army Major General William Sibert , who was the Director of the Chemical Warfare Service. I like this line: "The importance of a prompt return of the census blank, properly filled out, by every chemist of the country cannot be overstated." "Already in the early part of February 1917, the President of the American Chemical Society, Dr. Julius Stieglitz, had offered without reservation the services of the members of the American Chemical Society to President Wilson in any emergency that might arise and had received an appreciative reply." Something tells me that a modern ACS president would not dare do such a thing. Employment: "91.9% of ACS member chemists are employed full-time—defined as at least 35 hours of work per week. Over the past decade, that rate peaked at 92.5% in 2008 and then bottomed out at 88.1% in 2010. By last year, it had recovered to 91.1%." Unemployment: "Conversely, 2.9% of chemists are unemployed, down from 3.5% last year and 4.2% in 2012. This improvement is echoed in unemployment statistics reported by the Labor Department’s Bureau of Labor Statistics. The ACS survey results also show that during the past 10 years, the unemployment rate among U.S. chemists has ranged from a low of 2.3% in 2008—early in the Great Recession—to a high of 4.6% in 2011." Education levels: "Degree level makes a considerable difference in employability. This year U.S. chemists with a bachelor’s or master’s degree are roughly twice as likely as those with a doctorate to be unemployed. Unemployment for Ph.D. chemists stands at 2.2%, compared with 4.2% and 4.6% for bachelor’s and master’s degree holders, respectively." Salaries not keeping up with inflation: "Meanwhile, median annual salaries for U.S. chemists are stuck at last year’s levels of $102,000 for Ph.D. chemists, $85,000 for those with a master’s degree, and $72,000 for bachelor’s degree chemists. Because inflation is eating away at those salaries, chemists are actually losing ground in terms of buying power compared with last year, Edwards says." A lackluster recovery, it seems. More later. Unemployed chemistry graduates breathed a collective sigh of relief today as the Bureau of Labor Statistics released its July Employment Situation Summary. Taylor Baker (22), currently working on a food truck, recently received her bachelors degree in chemistry from Northeastern University. "I'm so glad that the employment situation is looking better!" exclaimed Baker, ecstatic that unemployment in the chemical sciences at the bachelor's level fell from 4.6% to 4.2% from June to July. "Only half of my paycheck is going to paying off my student loans. The other half's going to rent for my Allston apartment, but at least I got approved for a $5000 line of credit!" added Baker. In other actions, the committee elected Joseph Heppert as vice chair and voted to recommend to the ACS Council that dues for 2015 be set at the fully escalated dues rate of $158, an increase of $4.00 versus the 2014 dues rate. That's a 2.5% increase, which is slightly higher than the 2.0% increase in inflation expected for 2014. I wonder if the Budget and Finance Committee is cognizant that their own society's Salary Survey indicates that median salaries were reported to be flat this last year? A long feature by Stephen K. Ritter on sugar and sugar substitutes, including Bob Lustig thundering away at sugar. Happily, some of Lustig's more controversial theories about carbohydrate chemistry are not present. I'd love to know if we're going to have taxation of sugared drinks and the like; if they start raising the price of ice cream, I'm gonna be unhappy. This article by Albert Censullo on the mole and the kilogram (including a quiz) were interesting and rather confusing for me, as a dumb organic chemist. I found this letter to the editor on fracking additives to be quite educational. The major responsibility is to monitor and maintain the following as specified in the individual employee training plan: Liquid and gaseous plant effluents, water quality in all plant systems, corrosion controls, biomonitoring, liquid radioactive waste processing, decontamination, environmental controls, personnel safety, and radiation and contamination surveys thus protecting plant systems, the general public and meeting regulatory requirements. This position will require shift rotation work. This position requires respiratory protection qualifications including the donning of SCBA. During your employment, you may be assigned to positions within the Emergency Response Organization (ERO) that require response to the station when an emergency is declared. If you are assigned to one of these positions, a condition of continued employment will be your ability to arrive at the station to perform ERO responsibilities within 45 minutes of notification of an emergency. Sounds interesting. Pays $25.69 to $37.05 hour (depending on experience). Parents warn of crucial "babysitter skills gap"
"We just can't find people who have college degrees in early childhood education, but are willing to work for $7.50 an hour to look after our two kids," they complained. "America has a shortage of child care providers and we need the best and the brightest from around the world to compete in our increasingly global child care labor pool." Fresh electrons from the BLS: the unemployment rate went up slightly (by 0.1%) in July. Nonfarm payroll growth was slightly lower than expected at 209,000 in July. The broader U6 measurement of unemployment was up 0.1% in July to 12.2%. Employment in the chemical manufacturing subsector was up 300 positions to 802,600. Seems like just yesterday that number was below 800,000; nothing other than a numerical milestone, really. Unemployment was down 0.2% for college graduates to 3.1%; unemployment for non-high school diploma holders was up 0.5% to 9.6%. All in all, a positive continuation of the "pretty okay" trend.